8th Week after Pentecost. Tone 6. Sisoes the Great, of Egypt (429). Synaxis of the Saints of Radonezh. Martyrs Marinus and Martha, their children Audifax and Abbacum (Habakkuk), and those with them at Rome: Cyrinus, the priest Valentine, and Asterius (269). 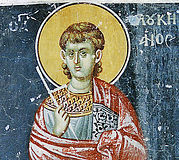 St. Cointus (Quintus) of Phrygia, confessor and wonderworker (ca. 283). Hieromartyr Isaurus, deacon, and Martyrs Innocent, Felix, Hermias, Basil, Peregrinus, Rufus, and Rufinus, of Apollonia in Macedonia (284). Virgin-martyr Lucy, Martyr Rixius, and those with them at Rome: Martyrs Anthony, Lucian, Isidore, Dion, Diodorus, Cutonius, Arnosus, Capicus, Satyrus, and others (301). St. Sisoes of the Kiev Caves (13th c.). Uncovering of the relics of St. Juliana, princess of Olshansk (16th c). St. Barnabas, elder, of the Gethsemane Skete of St. Sergius Lavra (1906). New Hieromartyrs Euthymius (Lyubovichev), hieromonk of Optina Monastery (1931). and Theodore (Bogoyavlensky), hieromonk, of Vostryakovo (Moscow) (1943). Hieromartyr Asteius, bishop of Dyrrachium in Macedonia (ca. 100). St. Monenna, foundress of Killeevy Monastery (Ireland) (ca. 518). St. Goar, hieromonk, hermit, and missionary along the Rhine (Germany) (649). New Monk-martyr Cyril of Hilandar, Mt. Athos, at Thessalonica (1566). 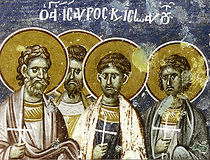 Apostles of the Seventy Archippus, Philemon, and Onesimus (1st c.). 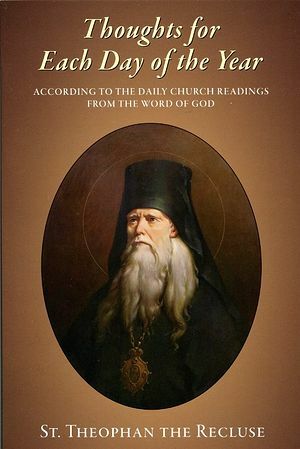 Repose of Archimandrite Arsenius (Papacioc) of Romania (2011). The Lord demands decisive self-denial of those who want to follow Him: Let him deny himself, He says. It could be expressed like this: Cast aside your interests and pursue only the interests of the Lord. You will be fulfilling this when you always do what is pleasing to Him. How can one do this? Mind carefully what is in you, and what around you on the outside, and discern strictly in one or another situation, be it internal or external, how to act in the way that is most pleasing to God—then, not pitying yourself and not inserting your own calculations, act accordingly, with complete self-denial. You say, “It is hard to determine this.” No, it is not hard. We have been given clear and fixed commandments— they express what we can do to be pleasing to the Lord. All that remains is to apply them to the given situation, and this does not present any great problem. Having common sense is enough. If you cannot figure something out, ask your spiritual father or someone else whose words you respect, and act according to his directions. But it is always better to sharpen your discernment through reading the word of God and writings of the fathers, so that you will always have a decision-maker with you.